Shield Argent, a fess Gules with its upper edge indented, in chief a pine branch Vert fruited Gules at dexter and an olive branch Vert fruited Sable at sinister, in base a mountain issuant Vert. Mural crown Argent with three visible towers (village rank) and white scroll with inscription in black initials "FREGUESIA DE MAÇÃO". Mação Commune was one of the pre-2013 communes of Mação Municipality; it had 2228 inhabitants in 2011 and covered 67.3 km². The arms are Azure a scallop Or and two Stars of David Argent all set in chevron, in base a triplemount Or. Mural crown Argent with three visible towers (village rank) and white scroll reading in black upper case letters "PENHASCOSO". The Stars of David might be related to local communities of crypto-Jews. Penhascoso Commune was one of the pre-2013 communes of Penhascoso Municipality; it had 802 inhabitants in 2001 and covers 39.6 km². Shield Or, a watermill's wheel Sable, flanked by two olive branches Vert fruited Sable and tied in base, in chief three eradicated chestnut(?) trees Vert fruited Gules in fess. 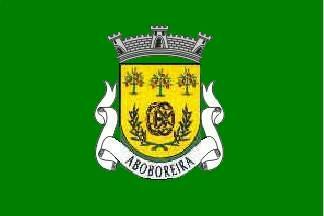 Mural crown Argent with three visible towers (village rank) and white scroll with inscription in black initials "ABOBOREIRA". Aboboreira Commune was one of the pre-2013 communes of Mação Municipality; it had 513 inhabitants in 2011 and covered 27.2 km².